I'm so busy. Seriously haven't stopped all day. Sleep training, weening, and dieting do not go well together. Over the weekend I canned 29 pints of Zucchini and Regular Salsa and 5 pints of Spaghetti Sauce. The smell is still lingering in our house. But tonight, I work on preparing for a Baby Shower tomorrow. I've planned a few cute decorations and we're going to have a Chocolate Fountain! Wahoo! I have to share the invitation I made for it. It's too cute. All names and personal information has been altered to protect the identity of my friends. Love this invite...What is your fee for this invite? 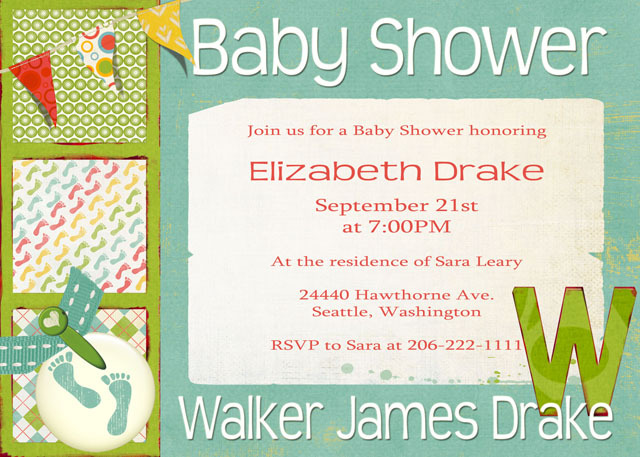 My baby shower is Jan. 22, 2011. Katie, I don't have a way to contact you so please email me if you would like these still. I would charge $15 for a High Resolution file that can be printed, and I would include a Smaller version of the same that can be emailed out. If you want me to have them printed, I would have to look into pricing on that.